Each year, Heart of Texas Writing Project offers several Saturday workshops for K-12 Austin area teachers. Our workshops are held on the University of Texas at Austin campus from 9am to 1pm and are designed to meet the specific needs of area teachers of writing. We design and provide workshops around topics such as getting writing workshop going, teaching writing workshop to primary students, meeting the needs of multilingual learners, and addressing social issues in a writing workshop classroom. 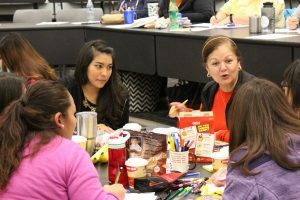 At these workshops, Teacher Consultants lead teachers in break-out sessions where teachers read articles, engage in discussions, and hear from other area teachers about their experience and knowledge in the topic at hand. Visit our calendar of Saturday Workshops here!